Fried chicken might just be the perfect food—crispy, juicy, delicious in every language. Here, Japanese fried chicken meets an American classic. 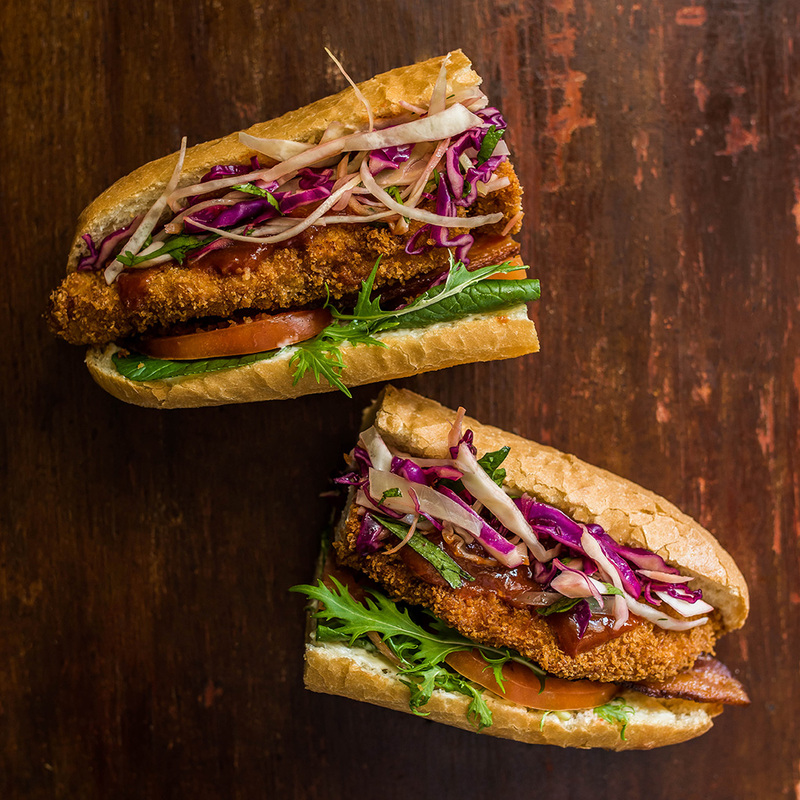 We give you the Katsu BLT. Line a baking tray with parchment paper and lay out bacon strips. Bake for 25 to 30 minutes, turning halfway through, until crispy. Blot any excess grease with a paper towel and set aside. In a small bowl, combine sesame oil, lime juice, soy sauce, vinegar, ginger and garlic. In a large bowl, combine the cabbage, carrot and cilantro and add soy sauce mixture. Cover with plastic wrap and place in the fridge. Butterfly the chicken breasts and cut into two equal pieces. Lightly pound chicken breasts by hand until they are equal in width. Season with sea salt and sake and allow the chicken to marinate for 15 minutes. Prepare two bowls, one with the beaten eggs and one with panko. Dip the chicken in the egg wash, coating well, then cover with panko. Fry for 5 to 6 minutes, turning halfway, until cooked through and deep golden brown in color. Build subs by first slicing the katsu pieces in half. Smear 1 tablespoon of mayo on the bottom half of each sub. Next, add 2 strips of bacon and a few slices of tomato. Add chicken pieces and top with 2 tablespoons of katsu sauce. Top with slaw and serve with extra sauce.